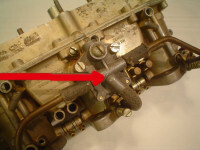 I also specialise in the overhaul of carburetters for classic Porsche, i. e. 356 (40-PII). These bodies are prone to warp (flange) when overtightened, which also distorts the throat to an oval shape. Too much mixture then passes the butterfly, and too high tick-over is the result. The bodies are bored out to Ø41mm and oversize throttle discs are turned to fit. The aluminium return-levers (acc. pump) are fitted with wear-resistant bushes. Return spring for above, is re-newed. A wear-resistant pin replaces the old-type steel one, swivel-arm, acc. pump. Acc. pump connecting-rod is re-newed. Wear-resistant thrust-washers are used for above. Swivel-arm ears (acc. pump) are strengthened to 3mm, or replaced with new ones. Ball-heads and cups are re-newed. 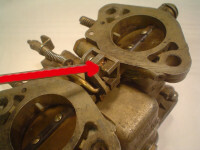 Worn return-spring holders (operating-lever) are re-newed/re-welded. 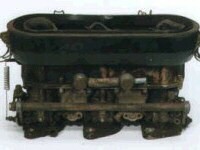 The later Solex 40 PII models (mostly from the 912) were produced with two short spindles which extremely shortened the production time than with the very costly precision spindles of the earlier models. To prevent backlash between the lever on the first throat and the adjusting screw on the second throat, a flexible rubber insert was used. These were fine at the beginning, but they gradually aged and became hard and brittle and eventually broke up and fell out causing the sychronisation to end. Even though this means more work, I only use solid spindles and don´t use split spindles any more. Reliability is guaranteed. 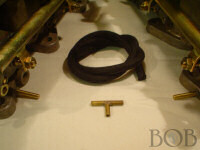 For this purpose new accelerator pump and operating levers have to be re-produced (see photos). 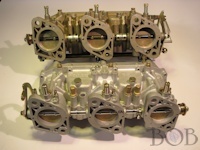 The finished carbs are bench-flowed anyway, so any slightly offset spindles can be reworked. Both throats must open and close exactly together. 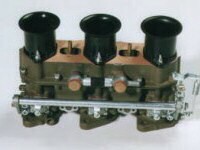 The later models of the triple throat Zenith 40 TIN from the 911 T, had an enriching device for mid range use (see photo). They operated at deceleration to ensure that the carbs delivered a completely combustible mixture even when the butterflies were closed. The American vehicle administration dictated this obligatory method, so that unburnt gases, which are quite poisonous and may damage the environment, would not reach thus through the exhaust system. 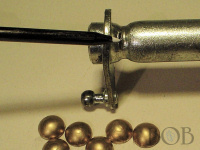 Other carb manufacturers developed similar methods. All the later produced Zenith carbs had such devices. Problems arise when the operating membrane gets old and brittle, likewise the electronic governor (on the left hand side in the engine compartment) which is controlled by the rev counter, gives trouble when worn. To solve these problems, I modify them to European standard, i.e. as the first models – I mean, the cars aren´t driven every day. Problems always arise with the coupling-connectors between the single spindles – they turn, crack or loosen. I´ve solved this problem by producing completely new oversize spindles. This is rather complicated, but the hassle is solved. 911 models from 1972, carb as well as injector engines, which were fitted with "late" vacuum jacks on the distributor, tended to have an irregular tickover. 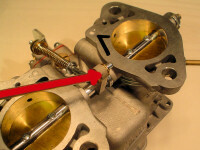 This was mainly caused by pulsing from the vacuum take-off connection on cylinder 1 of the carb or butterfly body. At low revs, "stuttering" of the short differances in pressure, not helped by a missing damper jet, led to this problem. This has been solved, in that I have modified the system in the following way: a second vacuum take-off connection has been added to cylinder 4 and the two fitted with a T-piece. Also the necessary damper jets have been added to prevent further pulsing. The continuous horizontal movement of this spindle, mostly in mid-range, causes wear, leading to difficult synchronisation around this area. I have produced special, hemispherical wearing-cups which are silver-soldered in place and then milled to rule out any play.Optimal synchronisation is now possible.